Stanley is like most squirrels: he loves nuts, climbing trees and playing with friends. But Stanley feels different from the other animals in his neighborhood, because he has a problem with words. Teased and bullied about his stuttering, Stanley refuses to let on that his feelings are being hurt, until one day he learns an important lesson from a new friend. Artie Knapp’s children’s book Stuttering Stan Takes a Stand is now available as a free flash-animated storybook from MightyBook Inc.
At mightybook.com there are more than 60 free animated stories, songs, games and puzzles. To read Stuttering Stan Takes a Stand click on the link below. 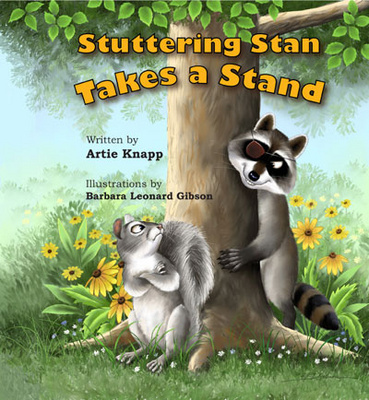 Stuttering Stan Takes a Stand is published by the Division of Speech Pathology at Cincinnati Children's Hospital Medical Center, which is the largest pediatric speech pathology program in the United States. Mr. Knapp writes a wonderful tale of friendship, building self-esteem and the understanding of others with disabilities. This children's book is about a squirrel who stutters and how his disability affects his life and those around him. Stuttering Stan learns that friendship, understanding and self-respect are important for everyone. This book should be read by all children and adults alike to reaffirm those important life lessons that Stan's story brings to the forefront. As one who stuttered and was teased throughout childhood, I read this elegantly illustrated story with great interest and anticipation. From the beginning, I identified with Stanley, the stuttering squirrel, as he encountered cruelty because of his speech. Knapp deftly shows Stanley’s ambivalence and hurt. The power of the tale, however, lies in Knapp’s bringing all the friends together during a scene of self-discovery, kindness, and forgiveness. This story will give courage to children who stutter, and it will help those who do not stutter become more understanding and empathetic. Children who stutter often bear the emotional burden of being targets for undeserved teasing and bullying. Stuttering Stan is such a gift to those children as well as to any child who is teased. It gives them an empowered model for handling those bullies! Thank you for this book, Mr. Knapp. Mr. Knapp has written a touching story about friendships, respect, courage and compassion. A must read for every child, especially those who stutter. This exquisitely illustrated story shows how being a friend can make others feel good about themselves. Every child is special in their own way and like many of Artie Knapp’s other stories, this humorous tale shows that you can do anything if you believe in yourself. Artie Knapp's knack for identifying the things that worry children shines in Stuttering Stan Takes a Stand. His characters, displayed in especially lovely illustrations, and their interactions, are those young children will recognize from their experiences on playgrounds and in their classrooms. Embedded in this appealing story are important messages about human kindness and acceptance of challenges. This is a book I will be recommending to educators everywhere.